Reverberation is defined as that portion of the sound received at a hydrophone that is scattered by the ocean boundaries or by volumetric inhomogeneities. Accordingly, reverberation-producing scatterers in the sea can be grouped into three classes: sea surface, sea floor and ocean volume. Surface and bottom reverberation both involve a 2D distribution of scatterers and therefore can be considered jointly as boundary reverberation. Volume reverberation is produced by the marine life and inanimate matter distributed within the sea, and also by fine-scale features of the ocean itself. Useful reviews of oceanic scattering and reverberation have been provided by Farquhar (1970), Andersen and Zahuranec (1977), Ellis et al. (1993) and Pierce and Thurston (1993). A collection of papers dealing with high-frequency acoustics in shallow water (Pace et al., 1997) addressed issues relating to scattering and reverberation in shallow water. Love et al. (1996) noted that variability is the principal feature of volume reverberation in littoral waters. Reverberation has several features that distinguish it from noise (Bartberger, 1965; Moritz, 1982). Principal among these is the fact that reverberation is produced by the sonar itself. Thus, the spectral characteristics of reverberation are essentially the same as the transmitted signal. The intensity of reverberation varies with the range of the scatterers and also with the intensity of the transmitted signal. Based on its characteristic temporal and spatial correlation properties, oceanic reverberation can be segregated according to diffuse and facet components (Gerstoft and Schmidt, 1991). Diffuse reverberation results from scattering by the small-scale, stochastic structure of the oceanic waveguide (e.g. surface and bottom roughness and bottom inhomogeneity). Facet reverberation results from abrupt changes in the bathymetric and subbottom features of the ocean (e.g. seamounts and faults). Due to its stochastic nature, diffuse reverberation is characterized by a relatively low correlation. Alternatively, the deterministic nature of oceanic facets gives rise to "signal-like" reverberation from seamounts and faults. where Sb,v is the scattering strength for boundary (b) or volume (v) reverberation, Is the intensity of sound scattered by a unit area or unit volume of water and Ii the intensity of incident plane wave. The computation of volume and boundary reverberation levels based on scattering strengths is discussed in Chapter 9. The major source of volume reverberation in the sea has been established as biological (e.g. Johnson et al., 1956). Different marine organisms affect different bands of the active sonar spectrum. At frequencies in excess of 30 kHz, the scatterers are zooplankton. At frequencies between 2 and 10 kHz, the dominant scatterers are the various types of fish that possess a swim bladder (an air-filled sac that enables fish to maintain and adjust their buoyancy). Acoustically, the bladder amounts to an internal air bubble that becomes resonant at a frequency depending on the size and depth of the fish. Love (1978) reviewed the current understanding and modeling of swim bladder resonant acoustic scattering. Saenger (1984) developed a volume-scattering strength model that is valid over the frequency range 1-15 kHz. The depth variability is a function of seasonal bioacoustic constants (organized by ocean province), the mean water density profile and its gradient, and the acoustic frequency. The absolute level of the volume-scattering strength depends upon the seasonal standing crop of scatterers, which may exhibit interannual variability. where n is the number of fish in the layer and a the acoustic cross-section of an individual fish (cm2) at any given frequency (f). The parameter a represents a swimbladder-bearing fish as a spherical shell enclosing an air cavity in water. Love (1993) concluded that a possible pitfall of relying solely on fishery data to predict low-frequency volume reverberation is that fishery research concentrates on species of present or potential commercial value. Species of no commercial value could be ignored in such data, despite their potential contribution to low-frequency volume reverberation. Measurements of the depth variation of volume-scattering strengths show an overall decrease with increasing depth. This is consistent with the general distribution of biological organisms within the sea. However, there is often a well-marked increase at certain depths. The depth of such increased volume scattering is called the DSL. The DSL generally exhibits a diurnal migration in depth, being at greater depth by day than by night, and with a rapid change near sunrise and sunset. The depth of the DSL can be expected to lie between 180 and 900 m by day in mid-latitudes, and to be shallower by night. In the Arctic, the DSL lies just below the ice cover. Greene and Wiebe (1988) reported on the use of high-frequency (420 kHz), dual-beam acoustics to measure target strength distributions of zooplankton and micronekton. Their results are consistent with the present picture of the diel vertical migration of sound-scattering layers in the ocean. At this frequency, the most abundant targets (off the northeast coast of the United States) corresponded to animals the size of mature krill with target strengths between -71 and — 62 dB. The use of acoustic techniques to estimate biomass has also been explored (e.g. Penrose et al., 1993; Wiebe et al., 1995). Some kinds of scatterers in the sea, such as the DSL or a layer of air bubbles just below the sea surface, lie in layers of finite thickness instead of being diffusely distributed throughout an irregular volume. The resultant layered reverberation is more easily considered as a form of boundary reverberation. When the layer is made infinitely great, the quantity in Equation (8.1) becomes the scattering strength of the entire water column and is called the column, or integrated, scattering strength. It can be readily measured in the field by means of explosive sound signals and sonobuoys, and it is a convenient single number to characterize the total amount of volume reverberation existing at the time and location the data were obtained. 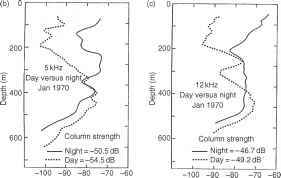 Figure 8.1 Comparison of day and night profiles of volume-scattering strength versus depth during January 1970 in the eastern Pacific Ocean: (a) 3.5 kHz, (b) 5 kHz and (c) 12 kHz. Column strengths are calculated by integrating the volume scattering strengths over the entire profile (Vent, 1972). Measurements of volume reverberation have been obtained, for example, by Vent (1972) and by Gold and Renshaw (1978). Figure 8.1 compares day and night profiles of volume scattering versus depth during January 1970 in the eastern North Pacific Ocean at three frequencies: 3.5, 5 and 12 kHz (Vent, 1972). The corresponding column strengths are also indicated. Note the large differences in scattering strengths between night and day. It is important to note that different reverberation models require different characterizations of volume-scattering strengths: some require input as a profile versus depth while others require input as a column-scattering strength. Pelagic organisms tend to favor horizontal orientations, thus forming what are termed scattering layers. In certain areas of the oceans, the seepage of gas or liquids from the seabed produces vertical-scattering plumes that are detectable over the frequency range 10-1,000kHz (Hovland, 1988). A special case of particular interest to underwater acousticians concerns the plumes formed over some seamounts. A scattering plume over the Hancock Seamount in the Hawaiian chain was investigated using an echo sounder operating at 38 kHz. This plume was detectable over a vertical extent of approximately 300 m directly above the seamount. These seepages appear to attract various marine organisms that might further complicate the scattering dynamics in the water column overlying seamounts. The roughness of the sea surface and the presence of trapped air bubbles make the sea surface an effective but complex scatterer of sound. Scattering can occur out-of-plane as well as within the vertical plane containing the source and receiver. Sea-surface scattering strengths have typically been measured using nondi-rectional (mostly explosive) sources and receivers as well as directional sonars in which a sound beam is formed so as to intercept the sea surface at a desired angle. The scattering strength of the sea surface has been found to vary with grazing angle, acoustic frequency and the roughness of the surface. Sea-surface roughness is usually characterized either by the near-surface wind speed or by wave heights. The measured scattering strengths show a strong variation with frequency at low frequencies and low grazing angles, and little variation with frequency at high frequencies and high grazing angles.